A set of four brass Hudson’s Bay Company trade tokens. One side features the company’s corporate crest. The reverse side indicates the denominations or values of the tokens, along with the letters “M.M.” that stand for the East Main trading district. Learn more about the value of furs - enter 'furs' in the search box to your left. Check the Beaver Index - e.g., Medals and Tokens, by Larry Gingras, Summer 1968. The standard of value against which all furs, provisions and trade goods was measured was “One Made Beaver” (1 MB) of a prime male beaver pelt. Trade was conducted between Aboriginal traders and Company employees through a system of barter (goods in exchange for goods) where no money was used. Instead, European traders used “counters” to keep track of the value of each item traded. The counters were not distributed like money, but rather, remained at the post for the sole use of the European trader. In the early years, some posts used wooden sticks that were carved with the number “1” to indicate 1 MB. 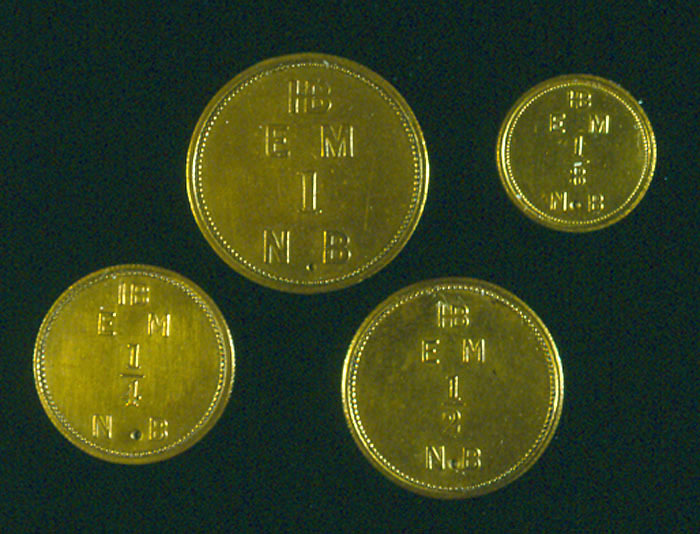 Brass tokens were introduced in the late 1800s by George Simpson McTavish Sr. in denominations of 1,1/2,1/4, and 1/8 MB for use in the East Main River district located south and east of Hudson Bay.